Colorful and engaging, Gymini's Monkey Island activity gym is packed with 18 developmental activities, including crinkly elephant ears, hanging toys, a sunshine mirror, a teething ring, and a musical monkey. Made for discovery and developmental learning, it grows with your baby through tummy-time and sit-up play. 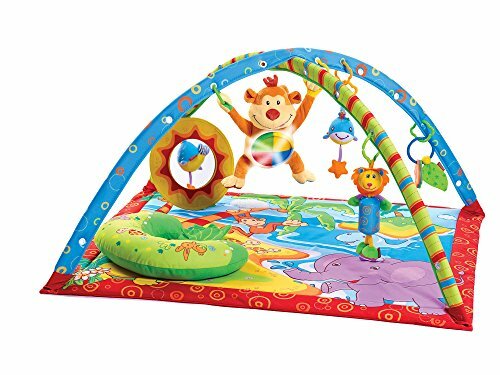 The soft, padded mat provides plenty of cushion and entertainment, with engaging toys that dangle from the bendable arches, and the musical monkey that plays tunes when touched. Lower the arches for tummy-time fun and use the special pillow to provide extra support for extended play. If you have any questions about this product by Tiny Love, contact us by completing and submitting the form below. If you are looking for a specif part number, please include it with your message.